Summary : This "speakeasy" pizzeria in Little Italy serves Neapolitan styles pies from a second floor space. There are some kinks to work out, but the pizza is tasty and worth checking out if you're in the area. 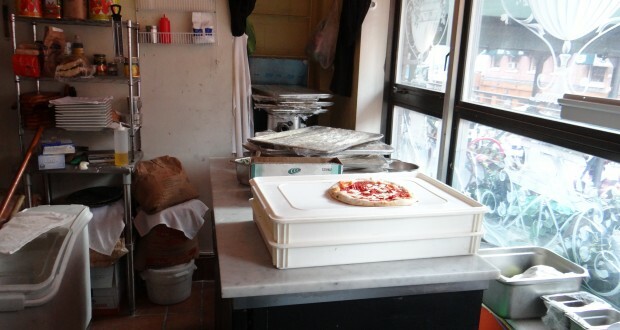 A new “speakeasy” pizza place opened its “hidden” doors in Little Italy earlier this year. It’s opening was covered pretty widely on sites like Thirillist leading me (and likely many others) to believe that the whole speakeasy concept was more of a marketing tactic. The last time I checked, speakeasies don’t send out press releases. That being said, there are so many new pizzerias opening in NYC every month, I understand the need to stand out of the pack. As my friends and I headed to 180 (180 Hester Street) on a recent Sunday night, I confirmed my belief that the pizzeria is not, in fact, hidden. It’s located on the corner of Hester Street and Mulberry Street, under an awning noting its address. Step inside and you can take the elevator up to the second floor. Or the stairs. I’m not sure which feels more like you’re entering a speakeasy, but I went with the stairs. The first thing you’ll notice when you get to the top is a multicolored pizza oven. This speakeasy is funky! Grab a seat by the window and you can watch the pedestrian traffic make their way up and down the streets of Little Italy. There is space for about 30 people in the dining room although on a Sunday evening in June the restaurant was nearly empty. The menu features nearly 20 pies and calzones, but boasts ingredients and pie names that are sometimes confusing. One pie contains carciofini. Nobody in our party of 12 knew what that was, so we had to look it up (artichokes!). Another pie, the Ortolan Vegan boasts “house-made fior di latte” (which, by the way, is cheese – not so vegan!) and ingredients like melanze (eggplant!) and pomodorini (cherry tomatoes!). It’s annoying to have to look up ingredients for every pie on your phone and it felt as if I was dining in another country. I should have asked for an English menu. The pies themselves were tasty, although not so much so that I’d run back to 180. A fan favorite seemed to be the Agrodolce Maria which features fior di latte, gorgonzola, pear, parmigiano and walnuts. It was sweet and creative. Misses came in the form of pies with too many toppings. The Capricciosa, for example, features pomodoro s. marzano, house-made fior di latte, prosciutto cotto, carciofini, black olives, porcini mushrooms, parmigiano and basil. The pies are Neapolitan in size, but the crust is crunchier than what you’d find in, say Naples. In addition, nearly every pie features “bubbles” which are larger and tougher than what you might find on an airier Neapolitan pie. Overall, I didn’t feel strongly about 180 one way or the other. Their pies seem authentic enough, but their location above a busy intersection in Little Italy makes me question who they are catering to. The place is just a little too hidden for a tourist, not in the know, to stumble in. And the place is in a location that is just a little too touristy for New Yorkers to frequent. So somewhere, 180 is trapped in the middle. I’m sure over time they will work out any kinks and find their niche. But for now at least they’re near the top, whether it be alphabetically or numerically, when people search for pizza online.